As Malawi stares at another cholera outbreak, personified by a Lilongwe-based driver who died in a lodge in Blantyre this month, our Staff Writer JAMES CHAVULA details how widespread use of contaminated wells in the capital city exposes perilous neglect and inequalities that fuel the preventable public health crisis. It was a wet November morning and first rains had just stopped when we arrived in Mitengo, a populous tip of the sprawling Area 38 Township in Lilongwe, Malawi’s capital. Farcically, in the peri-urban suburb, children grow up being told the community is neither part of the capital city nor the countryside. The common dilemma that marginalises populations adjacent to major cities is aptly personified by lack of potable water in the area. Nearly all residents drink murky water from shallow wells and a stream too close to latrines, an inequality with grave consequences on their well-being and public health. In January last year, persistent cholera attacks exposed the long neglected gaps in access to water, sanitation and hygiene. Since the outbreak receded last July, the locals have been worried that it may resurface if they continue living without safe water provided by Lilongwe Water Board (LWB). “These rains may as well be the start of another tough season. Cholera hit us hard at the onset of the previous rainy season and we don’t want that to happen again,” said Group Village Head Sambani in the area. A 10-year-old girl who died of cholera in February has become a face of the rising demands for safe water in the excluded community near LWB headquarters along Lilongwe City West Bypass Road. In the population, up to 10 households share a shallow well—and pit latrines as well. Among the locals, mentions of the diarrheal disease evoke flashbacks of the “premature death” of Aida Banda, who was a Standard Three pupil at the neighbouring Chisiyo Primary School. 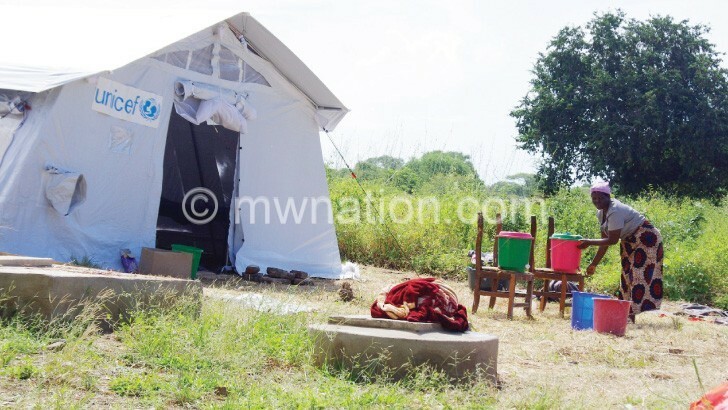 Her family has since relocated to Salima, but Mitengo residents vividly remember her mother’s plea when Minister of Health Atupele Muluzi visited the cholera hotspot not reached by LWB pipelines. “Her lamentation was in the news: ‘My child would not have died if we had safe water in the village’. Her cry is our cry. We want a lasting solution to water problems. During the outbreak, water and hospital officials told us to stop drinking water from shallow wells and streams because it is highly contaminate by urine and faeces,” explained Sambani. During the visit, the community leader took us throughout the clustered settlement, pointing at the worst hit households. They included a residence where cholera attacked the father, mother and two children before spreading to neighbouring households. In Chakwanira area, a pregnant woman delivered a stillborn in a cholera treatment centre at Bwaila Hospital as labour pains started when she was too weak to give birth. In the vicinity, another woman, who was pregnant when she was taken ill, had just given birth to a bouncing baby. “It’s a miracle I survived where my colleagues died. I hope my baby will not grow in an environment without clean water and sanitation as we are living,” recalled the survivor with a baby, opting for anonymity to avoid stigma associated with the hygiene-related disease. From her home, the lengthy journey took us to a grass-fenced house on a gullied river bank of Mudyankhunu stream, where greenish, soiled water meanders past heaps of assorted waste material from nearby homes and markets. The late Aida lived there until the fateful day. In the riverside household, women and children were spotted drawing water from a protected well less than five metres from a latrine. This aptly illustrates the major tragedy in the densely populated urban community. At the height of the cholera outbreak, the population scrambled for water rations from trucks and four bladders deployed by Unicef Malawi in partnership with LWB with funding from UK Aid. The major challenge is the water has not yet reached several parts of the city with safe water. The worst hit are suburbs and slums where low-income earners escaping poverty in rural areas live. For months, the Unicef supported Mitengo and other excluded communities with chlorine for water treatment and mass awareness campaigns for improved sanitation and hygiene. Desperate for safe water, women from Mitengo cross a battered bridge on Mudyankhunu to draw water in Tumbwe location on the other side, where LWB pipeline stops. The stream between highlights age-old inequalities that leave Mitengo residents at risk of another outbreak like the one that killed Aida and 17 others. “Access to safe water and improved sanitation for the majority of peri-urban population can reduce cholera outbreaks. Unicef is concerned with these inequalities. During the outbreak, we provided leadership to bring together different stakeholders. We have continued working with LWB to improve the situation. They need to find ways to increase access to sustainable water supply,” says Patrick Okuni, the chief of Water, Sanitation and Hygiene (Wash) at Unicef. The demands for water loomed large during theatre for development sessions and stakeholder meetings in which community members collectively explore ways to overcome main challenges affecting them. They transitioned into community meetings with LLWB officials. By August, the water board had constructed water kiosks in Kauma, Mchitanjiru, Nankhali and Tchetche and other cholera hit areas that had no potable water. At that time, the water board’s technical assistant, John Njewa, revealed that plans were underway to bring safe water to Mitengo though it is located outside the utility’s zone. In November, there was excitement in Mitengo when LLWB deployed contractors to drill boreholes with submersible pumps to push water into pipes that would keep the excluded areas supplied. On the way to the late Aida’s school, Group Village Mitengo pointed to the roadside where pipes will pass and some more boreholes will be drilled.